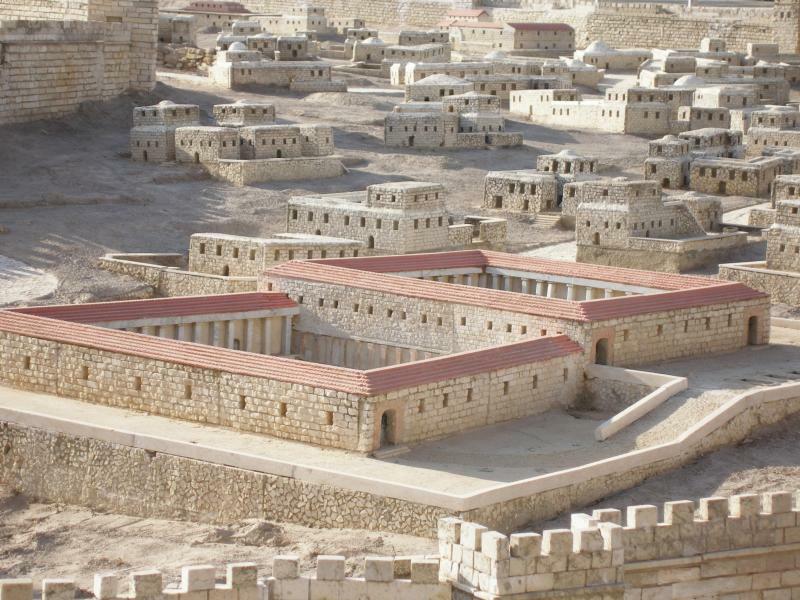 To visualise old Jerusalem at the peak of its power, look down on the outdoor scale model of the ancient city at the Israel Museum. 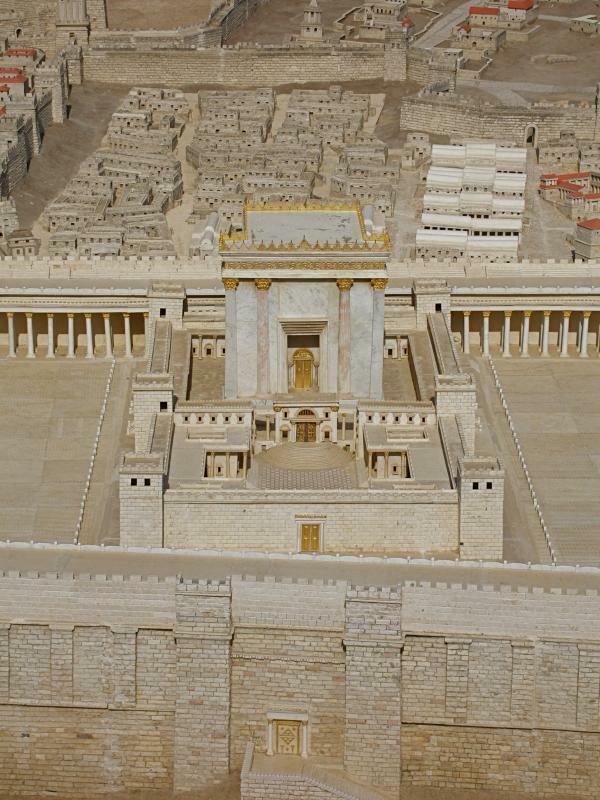 The gold-trimmed Second Temple and its vast courtyard dominate the Model of Ancient Jerusalem. Herod’s Palace, the twin-spired Palace of the Hasmoneans, the streets and markets are all identifiable. The time is AD 66, the fateful year the Great Revolt against the Romans erupted, resulting in the destruction of the city and the Temple built by Herod the Great. All that’s missing from buildings of Jerusalem limestone are the people. This is also the time when Christianity was in its formative stages and the Dead Sea Scrolls — now housed in the museum’s Shrine of the Book — were being created. The crucifixion of Jesus Christ was only 36 years before, and the mound of Calvary can be seen just outside the Second Wall (but well inside the new north wall begun by Herod Agrippa I). The ancient city was then at its largest, spreading over 180 hectares — more than twice the size of the present Old City. 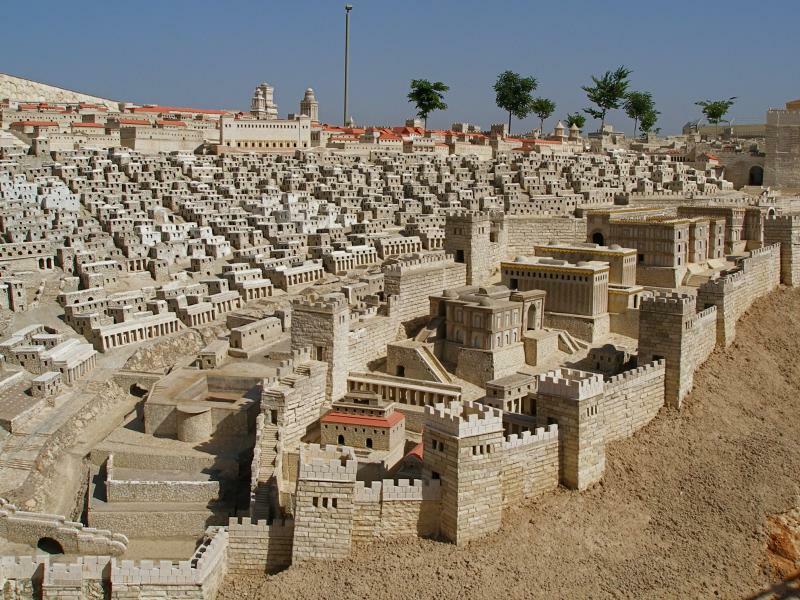 Construction of the Model of Ancient Jerusalem was undertaken in the 1960s by Hans Kroch, owner of the Holyland Hotel, in memory of his son Jacob, who was killed in the 1948 Arab-Israeli War. Originally in the grounds of the hotel, it was transported in 1000 pieces to its present site, 5km away, in 2006. The model covers nearly 4000 square metres, using a scale of 1:50. A human figure on this scale would be about 35 millimetres high. Archaeologists (principally Professor Michael Avi-Yonah of the Hebrew University of Jerusalem), historians and architects contributed their expertise to the re-creation of ancient Jerusalem. The main sources used were writings from the Roman period, construction techniques used in ancient cities similar to Jerusalem, and archaeological discoveries from Jerusalem itself. Subsequent excavations in Jerusalem have enabled the model to be refined and updated archaeologically. Another feature which appears to lack archaeological basis is the red-tile roofing. No roof tiles have been found in excavations of Jerusalem, however there are too many tiles in the model to make a change. Visitors may walk around the model, though there is no protection from sun or rain. They are not allowed to walk inside the walls.